Dr. Slick has announced their new fly-fishing and fly-tying tools for 2014-15, including Typhoon Pliers, clamps, Turbo Hook Dubbing Tool and Bent Shaft Scissors. Fully machined aircraft aluminum pliers, Bent Shaft Scissors, Long Range Clamps (hemostat and mitten) to keep predator fish teeth at a distance and a Turbo Dubbing Tool with a strategically placed weight to assist fly tiers are three of the new products designed and developed by Dr. Slick Instruments for Anglers, said Steve Fournier, president. The new fly-fishing and fly-tying tools for 2014-’15, account for 14 products based on various sizes and colors. The 6.5-inch, 4.5-ounce Typhoon Pliers will fill the needs of fly-fishers, spin- and conventional fishers, big game fresh- and saltwater anglers. Anodized gold and green, the pliers come with a coiled bungee lanyard, dual-pocket Nylon holster and replacement cutters, jaws and hex key. The extra cutters, jaws and hex key are packaged separately to be used as needed. The HR (Rockwell Hardness) 70+ side cutters are lethal on all monofilament, new age braid and synthetic lines plus coated wire up to 60-pound. Dr. Slick Typhoon Pliers jaws have a half smooth and half striated design for gripping hooks securely made from heat-treated SUS420 J2 coated stainless steel with a HR of 52. 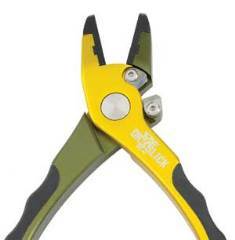 The pliers’ frame is 6061-T6 aircraft quality anodized aluminum to withstand salt water, and is equipped with non-slip rubber grips and a self-opening spring. “The Typhoons are individually machined – not die cast – and the result of about 14 months of design, testing, hand balancing and repeating most processes until we got them right. And ‘right’ they are,” said Fournier. The new Dr. Slick Typhoon Pliers have a suggested retail price of $60. Dr. Slick’s 9- and 10-inch Long Range Clamps are the result of fly-fishers more frequently targeting species with teeth that can draw blood: barracuda, muskie, northern pike and sharks. “Longer clamps are the ticket when it comes to avoiding treble hooks on bass lures; trailing hooks and stingers; dry fly and nymph dropper rigs and other terminal tackle that can come back and bite the angler’s hand,” suggested Fournier. At home in fresh- or saltwater, the long, heavy duty shanks and short powerful jaws make short work of deep hook removal, big barb crushing, and closing shot. “And if you happen to be a parent, the 9- or 10-inch clamps are equally great for retrieving small toy cars from under the refrigerator,” he said.The Long Range clamps are available in either a gold or black finish; straight or curved jaw; half smooth and half striated jaw structure. Eight-inch Long Range Mitten Clamps are available with a gold handle or black finish with half-smooth, half-cross hatch jaws. Mitten clamps fit directly in the angler’s hand and don’t rely on thumb and forefinger loops. Dr. Slick Mitten Clamps come with a removable security wrist lanyard. Suggested retail pricing: 9-inch Loop Clamps, $19.50; 10-inch Loop Clamps, $20.50; straight 8-inch Mitten Clamps, $23. The Dr. Slick 4-inch Turbo Hook Dubbing Tool applies threaded dubbing materials to the body of a fly. The turbo model tying tool has a strategically weighted disc base that allows for rapid spinning and a two position hook for accurate control. Suggested retail price: $8. According to Dr. Slick’s team of fly-tying consultants, the 4-inch Bent Shaft Scissors –may look “a little different, but they do the job like nothing else.” The bent shaft keeps the scissor from lying flat, allowing the fly tier to easily pick it up. Once in hand, it handles and performs identically to straight scissors. Bent shaft scissors are available in Tungsten Carbide (TC) and Razor models as well as other popular sizes and styles. “For those tying predominately with synthetic materials, consider the Tungsten Carbide or Razor,” suggests Fournier. Suggested retail prices: Tungsten Carbide, $30; Razor, $30. Founded in 1989, Dr. Slick produces 300+ fly-fishing and fly-tying related products including various models and sizes of scissors, pliers, clamps (hemostats), retractors, nippers, hook files, necklaces, fly floatant, hair stackers, titanium and ceramic fly-tying bobbins, hackle pliers, tweezers, whip finishers and dubbing tools, as well as a growing OEM and custom manufacturing division.